Fastener Corrosion is a natural phenomenon, as nature seeks to recombine elements which have been refined by humans into a purer form. 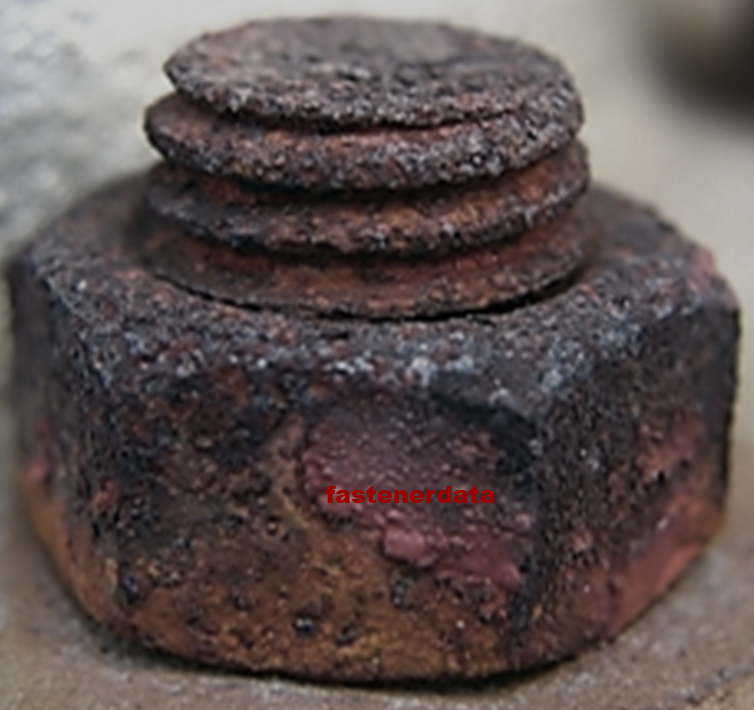 Iron occurs naturally as ironstone, pure iron being unstable and wanting to rust in the presence of oxygen and water. Fasteners made of carbon steels are an alloy of Iron, carbon and other elements; and stainless steel despite its various additions of Nickel and Molybdenum still behaves like steel, even 316/A4 stainless steel has around 60% content of iron. The corrosion resistance of stainless steel is dependent on a thin invisible layer of chromium oxide on the steel surface. There are environments that break down this passive film, and several forms of corrosion can form on stainless steel. The passive film is self-healing if given a stable environment including oxygen. Stainless steel fasteners in an acid or hot alkaline solution can break the passive film, particularly in concentrated hydrochloric or hydrofluoric acids. Fasteners with localised pitting corrosion that attacks small spots on the Stainless steel surface primarily in neutral or acidic solutions containing chlorides or other halides. Chloride ions facilitate a local breakdown of the passive film. This is a localised corrosion found in Stainless steel fastener crevices and occurs under the same conditions as surface pitting. Narrow crevices such as thread connections are the most popular area to find this type of corrosion. In concentrated chloride environments with solid salt deposits on the surface and high humidity, Stainless steel 304 and 316 fastener materials under high tensile loaded can form surface cracks through the passive film. This will also happen with high tensile loaded fasteners in alkaline environments at high temperature. It is essential when choosing fastener material to consider galvanic corrosion. Corrosive liquid solutions will act as an electrolyte when two different metals are immersed, and each will develop a corrosion potential. The more noble metal will become the cathode, and the more active metal will become the anode. A current will naturally flow between the two materials and corrosion will increase on the anode. Intergranular is corrosion in the grain boundaries between the different materials that make up Stainless steel fasteners. When the steel is produced, it is hoped for a uniform mix, in practice elements particularly Chromium carbide can localise within the material and reduce corrosion resistance at the boundaries. A combination of low loaded (fatigued) Stainless steel fasteners and chemical environments can produce fatigue failure and fatigue corrosion. Fatigue corrosion will shorten the life of the already fatigued fastener. In architectural applications, Stainless steel is chosen for its aesthetic qualities. Selection of Stainless steel is based on experience and knowledge about the environmental performance of specific grades. Atmospheric environments are split into four categories; rural, urban, industrial and marine. The importance of keeping stainless steel surfaces clean by washing to avoid staining, dust and a build-up of potential harmful corrosive materials cannot be stressed enough.